If you’re a football (more commonly known as soccer in US) fans, then Microsoft Football Scoreboard is the perfect program for you. Microsoft Soccer Scoreboard allows users to follow the progress and live game data of their favorite football teams, plus all 32 teams’ match schedule and standings as they advance, latest tournament news and information during the FIFA World Cup tournament in real-time. Microsoft Soccer Scoreboard has the intuitive and attractive Vista-like interface, including feature such as ability of transparency (Aero Glass) and a click to minimize the window size. Microsoft Football Scoreboard also acts as a RSS reader for your favorite sports-related RSS feed by displaying news headlines. Beside, for added convenience, you will find the match timing and start time in your local time according to Windows XP time zone setting. The Football Scoreboard allows you to follow your favorite football team from 32 participating countries such as England, Brazil, Argentina, Germany, USA, Australia, Iran, France, Japan, South Korea and etc, by select the team as Home Team. Once selected, the information displayed on the scoreboard will pertain to your home team. FIFA World Cup 2006 (Germany 2006) runs from June 9th to July 9th, 2006. So the data service for Football Scoreboard that streams information to the scoreboard will no longer be available after the tournament is over, although you will still be able to use the scoreboard to view stored information (scores, standings, etc.) up to 6 days after the World Cup tournament ends, but no new information will be displayed. 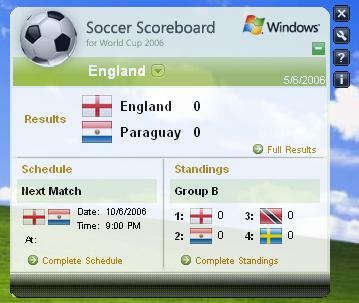 After 31st July 2006, the program will practically useless, and you will be prompted to uninstall and remove the Football Scoreboard. Microsoft Football (Soccer) Scoreboard can be downloaded from Microsoft (no longer available), provided you use and pass Genuine Windows validation. Other than English, Scoreboard also available in Chinese (Simplified and Traditional), Czech, Dutch, French, German, Italian, Korean, Polish, Portuguese, Portuguese (Brazil), Russian, Spanish, Spanish (Latin America), Swedish, and Ukrainian. Note: If you failed the WGA validation check, you can download Microsoft Football Scoreboard for Germany 2006 with direct download link: msscoreboard.msi (resource no longer available). For help, configuration guide, options settings guide, explanation and legend of Scoreboard’s Main, Results, Schedule, Standings and Second Round Window and uninstallation instruction, visit help page (link dead).